Preparations to launch a U.S. Navy communications satellite have kicked off in Alaska three weeks before a souped-up Minotaur rocket will pilot the spacecraft to an orbit 7,500 miles above Earth. Technicians began transferring the three lower stages of the Minotaur 4 rocket to Launch Pad No. 1 at Kodiak Launch Complex on Monday, kicking off assembly of the solid-fueled launcher ahead of its Sept. 27 blastoff. The Minotaur's first stage, a decommissioned SR118 Peacekeeper missile motor, was placed atop the launch pad's pedestal Monday. The second and third stages of the Minotaur 4 will be stacked Tuesday, according to Alaska Aerospace Corp., which operates the oceanfront launch complex. The launch site is positioned on the southern shore of Kodiak Island in southern Alaska. Workers inside a clean room at Kodiak are finishing up work on TacSat 4, a Navy-led satellite designed to offer additional UHF communications channels to U.S. forces in Afghanistan and the Middle East. Once the satellite is fueled and configured for launch next week, engineers will enclose the 1,000-pound craft inside the Minotaur 4 rocket's 92-inch payload fairing. The Minotaur's fourth stage and nose cone should be moved to the launch pad attached to the rocket around Sept. 14, according to the Air Force, which is providing the launch services for the Defense Department's Operationally Responsive Space office. After final readiness reviews and a mission dress rehearsal, officials will give a final go-ahead for liftoff Sept. 27 at approximately 1545 GMT (11:45 a.m. EDT), or just before sunrise at the Alaska launch site. TacSat 4's launch has been held up by rocket delays and a cramped Minotaur flight manifest. 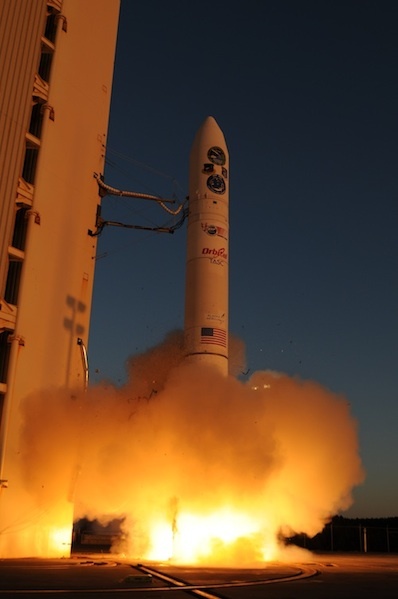 The military chose to fly other satellites before TacSat 4, pushing its launch from 2009 until this year, then an investigation into a failure of a similar Taurus XL rocket delayed the mission's start from May until September. The four-stage Minotaur launcher will boost TacSat 4 into an orbit stretching from an altitude of 435 miles to almost 7,500 miles above Earth. Its targeted orbital inclination is 63.4 degrees. File photo of a previous Minotaur 4 rocket launch from Kodiak, Alaska. Credit: Thom Rogers/T-Minus Productions Inc.
Orbital Sciences Corp., the Minotaur rocket family's prime contractor, is replacing the launcher's Orion 38 fourth stage with a more powerful Star 48 rocket motor to generate the energy needed to propel TacSat 4 into the high-altitude orbit. The Star 48 motor is produced by ATK Space Systems. The spacecraft will rapidly sweep near Earth on the low side of its orbit, then slowly rise high in the sky as it reaches its peak altitude, dwelling above battle zones for hours. Its orbit will place TacSat 4's communications payload in range of polar regions for much of its orbit. Existing communications satellites stationed over the equator have trouble reaching those locations. "Communication is a critical warfighting requirement," said Larry Schuette, the Office of Naval Research's director of innovation. "TacSat 4 will support forward deployed forces at sea and marines on the ground. We've developed a technology more rapidly and at lower cost that will supplement traditional satellites, giving multiple combatant commanders around the globe another outlet for data transmission and communications on the move." 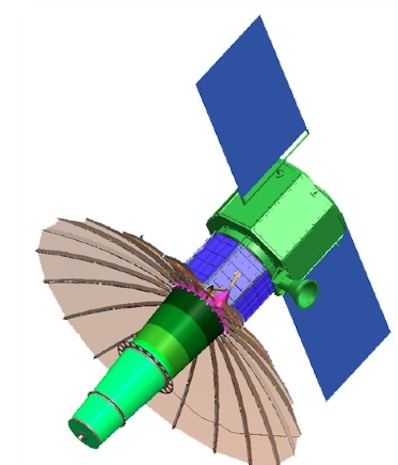 TacSat 4 is the third in a series of experimental tactical satellites developed under the military's Operationally Responsive Space initiative, which aims to field more focused, less expensive spacecraft to answer the needs of commanders in combat zones. The ORS office launched its first operational satellite in June on a mission to snap high-resolution images of battlefields and relay them directly to troops on the ground. TacSat 4 carries a 12-foot communications antenna to relay voice and data messages between military units equipped with small backpack or handheld radios. "We've got more 10 more UHF channels we can use," said Mike Hurley, director of spacecraft development at the Naval Research Laboratory, which manages the project. "They're very high-gain channels, which means that a marine or a soldier with a man pack or a handheld radio can actually talk to the satellite, which is not really possible now." The Navy is responsible for the military's UHF satellite communications, and its existing satellites have trouble reaching smaller radios that enable mobile units to communicate with each other. "That was a big design driver for TacSat 4, to be able to close that link," Hurley said. 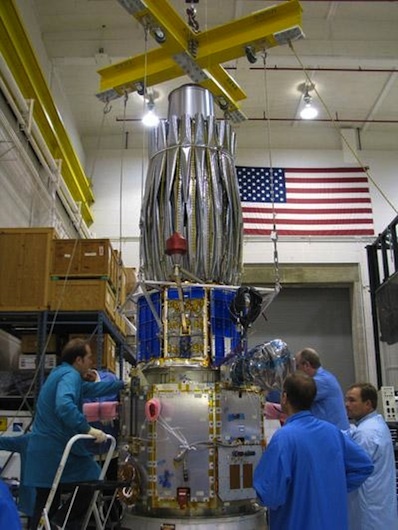 The ORS program was conceived to link satellites with far-flung military forces, including specialized units, to provide real-time communications, intelligence and reconnaissance data. "The real advantages of the UHF is the equipment can be generally smaller and cheaper, and the nature of that frequency is it will get through trees and rain all that stuff better than the higher frequencies," Hurley said. "From that perspective, it's often a more reliable link." The Naval Research Laboratory will control the spacecraft for the first year of communications experiments, then the satellite's management will be turned over to U.S. Strategic Command if officials believe there is an operational military utility for the platform.